For over fifteen years, off and on, since Richard Feigen introduced me to Ray Johnson we have periodically tried to organize a Ray Johnson exhibition for here, for Chicago, for anywhere. Somehow something, usually Ray, made it impossible. He seemed to want a show, he would send emissaries, I would get excited, then he would withdraw or somehow make it too difficult. I wrote to Ray, he sent me things, I kept on hoping. 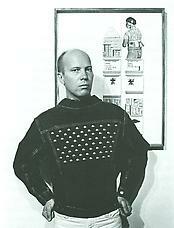 The Ray Johnson Show idea would ebb and flow. On January 6, 1995 Ray called me and said: “Well, I think you’ll really be able to do your show now, Frances.” I was very surprised, excited, and knowing Ray, suspicious at his seeming enthusiasm. I said “Nothing would please me more Ray, you know how important I think the work is.” I did feel like this was possibly the beginning of the show. Then Ray said ‘Yes, I’m finished with the nothings which I have been doing for years and I think I’m going to do,’ he laughed, “something”. We talked a bit more and hung up. Ten days later he swam out to sea. I cannot help thinking that Ray, if he had thought about it, knew that if he died, we would certainly do a show. I have tried hard to do a show which he would have liked, I would have preferred to still be doing a dance with him. This is a modest memorial to a great artist. I hope it gives those who didn’t know Ray a small idea of how much and why he will be missed. If you knew him it is clear to you. Excerpt by Frances Beatty as published in the exhibition pamphlet.